Did you see this? Donald Trump gave a rambling, incoherent, interview to the Washington post in which he (amongst other things) once again denies the science of climate change — including the report from his own administration released last Friday which shows that the climate crisis is already hurting and killing Americans. It’s got to stop. And you can help deliver a clear, unambiguous rebuke to Trump at next week’s climate talks – called the COP24. 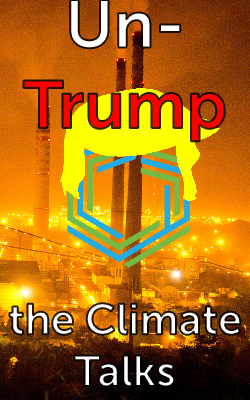 Here’s how: Trump’s team is planning a sideshow event that actually promotes fossil fuels at world’s biggest meeting on how to fight climate change. While everyone else is talking about the new US and UN reports on climate change and how we only have 12 years to fix the problem Trump wants to talk about how to pollute more and get rich off the resulting death and destruction. But we’re ready for him – Trump did the same thing at last year’s talks, and a brave delegation of youth, indigenous and frontline climate activists shut him down. Now, that same delegation is headed to the COP24 talks, and they need you to sign on to back them up. Click here to sign on to the People’s Demands for Climate Justice. These demands have been shaped by people’s movements from around the world that are directly experiencing climate change’s impacts. Early supporters include the Indigenous Environmental Network and Plataforma Boliviana frente al Cambio Climatico. It’s been years in the making, but we only get one chance to deliver them, and deliver them as a rebuke to Trump’s recent climate denial. We need to show that people everywhere, including in the U.S., widely echo and support these demands – and right now, your name is missing. Can you sign on today so we can deliver your name to the United Nations next week? It is a known fact that Trump is a very hateful person with a load of serious problems. Like Hilary Clinton said, the only person that Trump cares about is himself. She is right about that. This is not a future scenario. It is happening now. Enough of tolerated Trump’s ignorance and disbelief of data-based science. It is critical that we get down to combating green house gases and start to mitigate at the local and state levels. Not starting new fracking and oil ocean sites! Already we are seeing alarming massive disappearance of insects, fires above the Arctic Circle, populated islands that are not under water, erratic wild fires (world wide), global heat-related deaths and tropical diseases showing up in the US. We need to aggressively work on cutting down green-house-gases. Get the fossil fuel companies investing in solutions and profiting. Support the Bipartisan Carbon Fee and Dividend legislation to encourage them to move away from fossil fuels. Our planet 🌎 is at risk and there is now no time for chit chat. Action is what’s now needed and deniers can go sit in the corner and be quiet. We must only listen to the truth and the scientists and policy makers who can help save us. The rest of you are irrelevant. Climate change is real–far too real and we must not allow the nay Sayers and those that just do not care to win this fight! It is to important. The facts are ALL around us every day! Trump and his greedy, rich republican friends are definitely in the minority! The rest of the world understands the science of climate change, knows that it is caused by mankind, and that mankind must do what is necessary to fix the problem. Trump republicans only care about making money! They don’t want to understand that we only have 75 to 100 years of economically available fossil fuels left in the world so we will have to switch to other energy sources sometime! Due to fossil fuels damage to human health and the environment we should switch sooner then later! As a current Science Teacher/Environmental Educator and a former Engineer, and a renewable energy/environmental advocate, I wholeheartedly agree that we MUST eliminate our dependence on fossil fuels and prepare for the Renewable Energy and Energy Efficiency Revolutions (which have already started!)! Trump does not speak for most Americans on the issue of climate change. He speaks for the fossil fuel industry. Please do not listen to him. He is not a scientist. He is not an environmentalist. He is not intelligent or well-spoken. Please help convince him that his opinions and position will hurt our nation and the world. Thank you. Even if Trump doesn’t care. Please stop this idiot liar. tRumpf is such a Baffoon he should not be ask about climate change we need to just do and let the baffoon stew in his own soup until he is well done then dumped down garbage disposer he is useless to the people of US and should be thrown in jail NOW!!!!!!!! What could possibly be more important than that the world survives? How can trump not believe 300 scientists and 15 organizations? We must have sane people to protect us. Muchas gracias por luchar contra el cambio climático. Es tan absolutamente necesario y urgente y especialmente ante actitudes salvajes, como la del Sr. TRUMP y sus cómplices que no buscan otra cosa que su propio beneficio a corto plazo. Just because the baffoon, Trump, is an extremely idiotic moneygrubbing man, the rest of the world does not have to follow him.